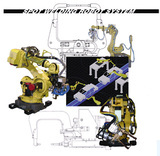 Sun Mechanic offers a comprehensive range of services for the design, assembling, installation, programming, and maintenance of industrial robot-based factory automation systems (automated and labor-saving manufacturing) and overhead cranes. We lead the industry in robot programming. 1. In cooperation with FANUC LTD., a leading manufacturer of industrial robots, we provide technical services by using 2D and 3D digital engineering visualization. 2. We provide comprehensive services for the design, manufacturing, installation, and maintenance of industrial robot systems and overhead cranes. 3. 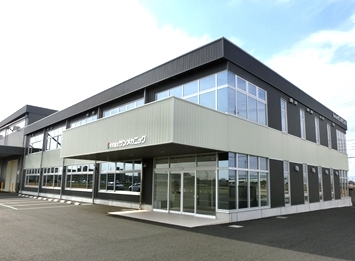 We are a technical service provider for FANUC LTD., Ishikawajima Transport Machinery Co., Ltd., and other major machine manufacturers. 4. 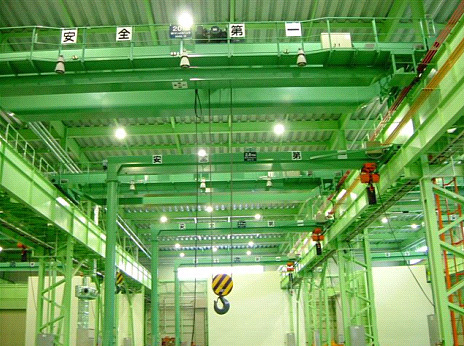 Overhead cranes are required by law to undergo periodic inspections, such as performance checks, so the demand for crane systems is strong. 5. We are on 24-hour standby to respond to any mechanical problems with multilevel parking garages.